Capture H.264-encoded video from the camera using the raspivid application. Convert the H.264 bitstream to constant bitrate and DVB compliant MPEG-TS stream using ffmpeg 2.2.2. Send the MPEG-TS stream to the UT-100C modulator using tsrfsend application. In my own setup I also use a 20 dBm power booster to increase the range. The idea for this setup, in particular for using the latest ffmpeg for MPEG-TS generation, comes from Evariste F5OEO who posted it on the Viva DATV forum. In fact, he has made a complete Raspbian image available for download for those who want a quick and easy way to get started. While his image works well, it will limit you to the software available at the time when he built the image. To get an idea of the video quality you can expect from this setup check out these test recordings I have posted on Youtube. Be sure to check out the recording of the HEAT 2X rocket being fueled with liquid oxygen at −180 °C. They were all recorded over the air using the Rocketcam 1 prototype setup and an RTL2832-based DVB-T dongle with modified drivers to work in the 1.3 GHz band. In the following sections I will describe each component of my setup. The first thing to do is to ensure that you have your Raspberry Pi up and running with an up to date Raspbian image and the RaspiCam. You can use this tutorial on the Raspberry Pi website. You should definitely get acquiantened with the raspivid application that is used to capture H.264 encoded video with the camera module. It is a great tool and you will also find it useful for other tasks. I suggest you create a working directory, for example ~/dvb/, where you can put the scripts and binaries used for the DVB-T setup. You can download my binary driver built for kernel linux-rpi-3.12.19+: usb-it950x.ko. 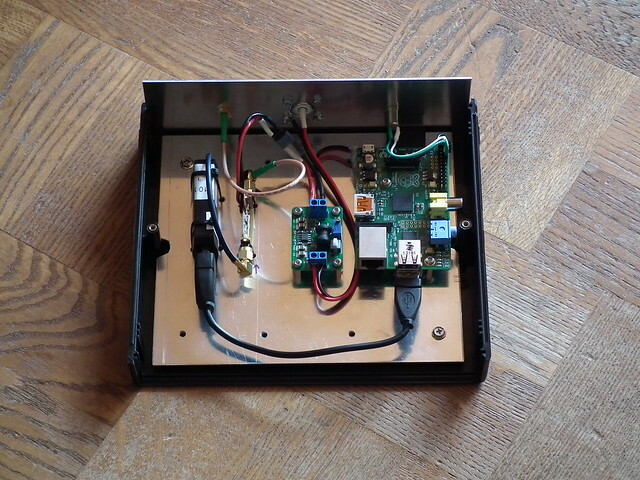 I have also posted instructions how to build the driver on the target (Raspberry Pi). You may have to do this if my driver is not compatible with your device. At the time of writing ffmpeg seems to be the only open source application capable of muxing H.264 video into DVB compatible, constant bitrate MPEG-TS. The downside of the ffmpeg muxer is that it adds a 5 second latency to the transmission. We’ll have to work on this. I didn’t build any addon libraries as I only want to use ffmpeg for TS muxing. During menuconfig of the crosstoll-ng under C library select eglibc 2.13 or whatever version comes with your Raspberry Pi. As you can see I had version libc 2.13 installed at the time of writing this article. Finally, we need an application that can talk to the UT-100 modulator, configure it and send the MPEG-TS steam to it. You can write your own application based on the API docs that come with the driver package or use the tsrfsend application included in the UT-100C Opencaster Bundle. There is no license included with the tsrfsend application so I can only assume full copyright; however, I hope I will not get into trouble for sharing my armhf binary with you: tsrfsend. If you have the sources you can simply build it on the Raspberry Pi, or try the cross compiler you created for ffmpeg. In either case you should apply the patch that I have posted on the Avalpa forum. Put the tsrfsend binary into the same working directory where you put the driver and the ffmpeg application. A few hints how to test the tsrfsend application are available in my previous post. We need a way to (1) send H.264 video from raspivid to ffmpeg and (2) send the MPEG-TS from ffmpeg to tsrfsend. Since all these applications can operate on files the easiest way to connect them is using named pipes (aka FIFOs). The names videoes and videots refer to video elementary stream and transport stream respectively. Having the pipes in place we can now launch the raspivid, ffmpeg and tsrfsend applications sequentially using the pipes for input and output. In the following example I use a 6 MHz channel, QPSK modulation with rate 1/2 FEC, 1/4 guard interval and 8k FFT. With these parameters the channel capacity is 3.732 Mbps which is what we set the ffmpeg muxrate to. THe video rate must be lower than that and leave sufficient margin for bitrate fluctuations. Therefore, I have set raspivid to capture 1280×720 pixel frames at 30 frames per second and 3.3 Mbps video bitrate. Note that I am using “sudo tsrfsend” because I did not configure any udev rule for the modulator that would allow using it as regular user. If you want to run the application as regular user, create a udev rule as I showed it in my previous post. In the example I am using 1.28 GHz carrier frequency which is in the DATV segment of the 23 cm amateur radio band. If you don’t have a DVB-T receiver that works at that frequency you can change it to some UHF frequency and use your regular digital television to receive it provided that it can do DVB-T and you are only transmitting in your lab with very low power. Check the regulations in your country to know for sure what you may and what you may not do. I have modified the RTL2832, R820T and E4000 drivers to allow tuning to L-band frequencies as supported by these tuners. We can also use ffmpeg to read from a file instead of the camera. In that case we use “… -re -i videoes …” to transmit in real time, otherwise ffmpeg will read and send the file as far as it can read it from the SD card. I haven’t tested this option much as I am only interested in live transmissions for now. I hope this guide was helpful and I am looking forward to see who will make the first handheld HDTV transmitter using a Raspberry Pi and a UT-100C modulator and in particular who will make it work from a flying drone.